“The greatest compliment that I can express to the acousticians on this project is that this multi-function arts venue worked straight out of the box on day one. 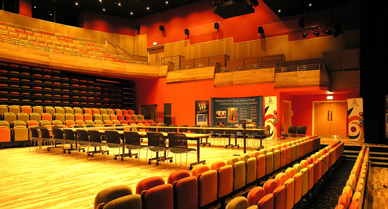 Working in partnership with Hunter Acoustics, we designed the natural acoustics of this £15 million replacement for the Theatre Elli in Llanelli. The new build theatre was to be the new creative and cultural centre for the performing arts, media and community events in the region, as well as home to Canolfan Sbarc, a cultural and social enterprise centre. The remit was therefore for a flexible auditorium capable of hosting a range of presentation requirements using industry standard and modest cost solutions. 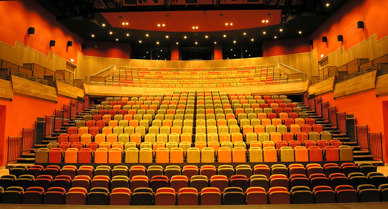 CATT Acoustic modelling was carried out to assess not only the reverberation time targets but also sound projection into the auditorium, clarity of received speech, natural acoustic enhancement by architectural elements, the incorporation of the assisted reverberation system into the theatre, and the received sound on stage. 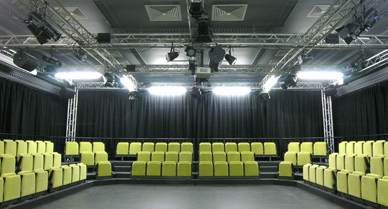 The new 504-seat theatre can be used either as a flat floor venue or, with the lowering of the stage elevator and extension of a retractable seating unit, a conventional theatre space. 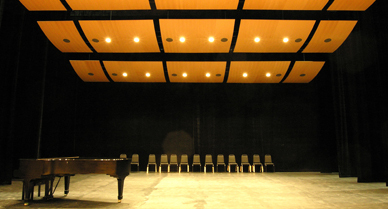 The main auditorium has been optimised for speech using a combination of absorption and reflecting panels, with a bass trap in the ceiling void. It has a natural reverberation time of 1 second. A reverberation enhancement system has been installed by ACS to accommodate a wider range of musical presentations, public meetings and social functions. 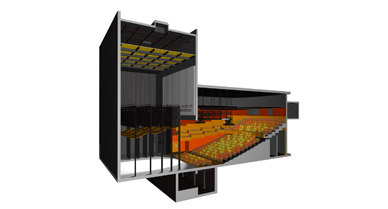 With the CATT Acoustic modelling, we could incorporate acoustical elements into the hidden parts of the auditorium such that the visual effect specified by the Architect and Theatre Consultant was not compromised. The use of the CATT Acoustic software enabled different options to be trialled during the design process and for optimum results to be obtained from basic materials. The theatre is sited alongside the Grade 2 listed Zion Baptist Chapel and Baptist School which has been renovated and also incorporates a 100-seat flexible performance space, Stiwdio Stepni. Do you have a similar acoustics requirement for your entertainment project? “Adnitt Acoustics' care and detailing throughout the design process was a real contributor to the problem-free commissioning of this theatre.